Clever Text is an SMS messaging application that allows its user to seamless engage with either a computer, or another human. It integrates human proficiency with computer ingenuity to create a harmless method of entertainment. We were inspired by a desire to create a more interesting method of rejecting awkward relationships and conversations. 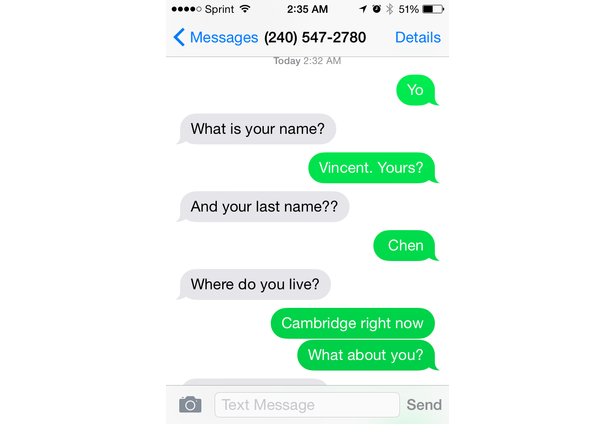 Our target user is anyone who feels uncomfortable giving out their number to a stranger that they just met. We are proud of our ability to deliver seemingly human communication. Our most successful feature is the continuation of a conversation. Comments for this submission are closed. View the software in spitzerw's portfolio to continue the conversation.